The nebula NGC 2170 by Robert Gendler and Ryan Hannahoe. 2,500 light years from Earth lies truly huge cloud of dense, cold dust and gas: Monoceros R2, which is a staggering 400 light years end to end. That’s four thousand trillion kilometers. 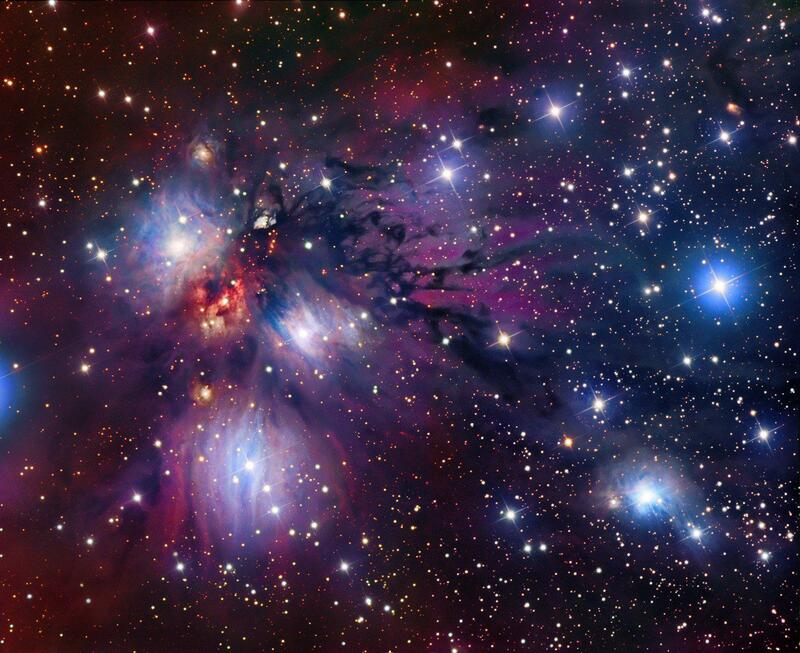 NGC 2170, a dusty gassy stellar nursery. Click to ennebulenate. There is dust everywhere you look in this picture. Consisting of tiny grains of silica and long molecules of sooty carbon, thick dust blocks starlight entirely. You can see fingers and ribbons of it strewn throughout the image. Thinner patches let some light through, but reddens the light in the same way that haze can make the Sun look red near sunset. Some of the reddish hue you see in the shot is due to this process. But some of that red —well, more pink— is from gas warmed by starlight. Hydrogen glows red when that happens, and you can see big, smoother areas of the gas near the stars. We call this an emission nebula, because the gas itself is glowing. There’s also blue stuff as well. That’s dust, reflecting the light of the massive, hot stars, which emit more blue light than anything else. These tend to be the brightest stars as well, so their light illuminating the dust outshines any fainter stars. This kind of nebula is called a reflection nebula. The stars you see here are young, probably around ten million years old or less, which sounds pretty old to most people. But the Sun is 4.5 billion years old, so to astronomers 10 million is a newborn. They haven’t even shed the cocoon of their birth! The brightest stars there won’t get to see the same age as the Sun, though. In a few million more years they’ll explode, what we call supernovae. When they do they’ll send their gas sleeting through space, where it will help other stars be born. They’ll also create yet more dust, which will pollute space and scatter around the galaxy as well. Of all the things I know, one of the most amazing is that the cycle of life we see here on Earth is, in a way, mimicked on a vastly larger scale in the cosmos. Materials bear stars, which have a life of sorts and then help seed the next generation. The Universe recycles! This won’t go on forever, but it will for hundred of billions if not trillions more years. We are still in a young Universe, with much yet to discover and investigate and ponder. I’m glad we have the chance to do so.